Barcelona's Sergi Roberto is being linked with Man United. Philippe Coutinho reportedly wants to leave Liverpool for Barcelona, while PSG are understood to be willing to pay £100 million (€110m) for the player. The Catalan club have also been linked with a move for Tottenham’s Dele Alli, as they bid to replace the departed Neymar. Meanwhile, another Tottenham player, Eric Dier, is wanted by Bayern Munich, who are rumoured to be preparing a £50 million (€55m) bid for the player. Barca have also targeted Julian Draxler according to Bild, after the German international’s agent was spotted in Barcelona. The La Liga outfit may also be set to part ways with another star. 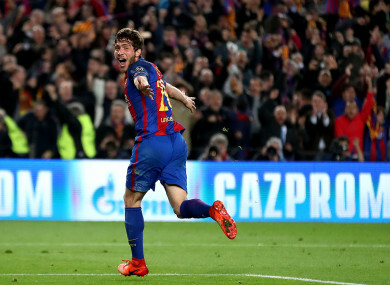 Monaco, Man United and Chelsea are in the hunt for Sergi Roberto, with the Red Devils seeing a £36 million (€40m) bid for the player rejected. Alexis Sanchez is reportedly willing to stay another season at Arsenal and leave on a free transfer once his contract runs out at the end of the campaign. Man City’s David Silva is planning to join Spanish side Las Palmas, when his current contract with the Premier League side expires in 2019. Leicester have rejected a third bid of £31.6m (€35m) from Roma for Riyad Mahrez. A key member of the Swedish side that finished third in the 1994 World Cup with four goals, Dahlin started his club career at Malmo before impressing while playing for Borussia Mönchengladbach. He subsequently joined Roma, but failed to make a substantial impact during his brief spell in Serie A. The striker signed for Blackburn in 1997, but could only manage six goals in 15 starts during a two-year stint with the club. After a similarly fruitless, injury-hit loan spell with Hamburger SV, a back injury forced him to retire in 1999 at the age of 30. “I just couldn’t do myself justice,” he said of the move to Blackburn in a 2010 interview with the Lancashire Telegraph. Email “Man United bid for Barca star rejected, Coutinho latest and all today's transfer gossip”. Feedback on “Man United bid for Barca star rejected, Coutinho latest and all today's transfer gossip”.